My grandson wanted a Thomas the Train cake for his 4th birthday. This was the first time I made this type of cake. The outside of the train cake was made of gingerbread cookies and inside the gingerbread cookies was a homemade pound cake. The icing was a cream cheese icing recipe tinted to the various colors needed for the train. For the decorations I used Dove chocolates for the headlights and cookies for the wheels. I even inserted a picture of my grandson in the window. All in all the cake turned out ok and most importantly, it tasted good. 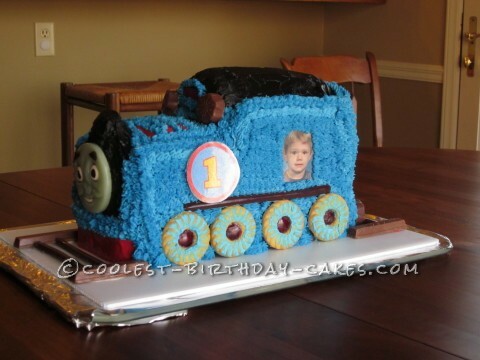 Birthday cake idea Posted by Yvonne S.
Coolest Ever Train Cake – So At-TRACK-tive!